Carol has worked at the Planning Commission for 28 years in a variety roles, including senior community planner and Planning Services Division director. Most recently, she served as the department’s Infrastructure and Plan Review Division director and oversaw plan reviews, environmental reviews, data and demographic activities, and pipeline initiatives (including management of the Pipeline Information Center). Prior to her tenure at the Planning Commission, Carol worked for private and public sector planning firms in Pennsylvania and Maine. Carol was promoted to this position following the retirement of David Ward, the former assistant director. “I’m looking forward to working with Carol in her new role as we move forward implementing Landscapes3,” said Planning Commission Executive Director Brian O’Leary, referring to the county’s newly adopted comprehensive plan. Stay tuned for a more detailed article about Carol and her career. 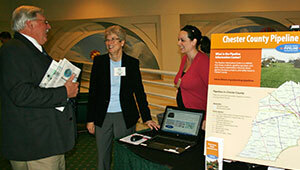 Photo Caption: Chester County Planning Commission Assistant Director Carol Stauffer, center, shared information about pipeline initiatives during a Chester County Association of Township Officials conference.